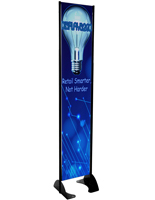 Are you looking for a way to attract the attention of passersby with vivid advertising displays at in high-traffic public environments? 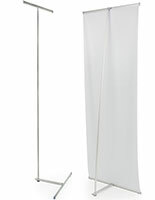 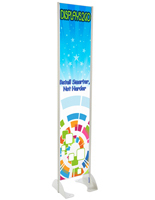 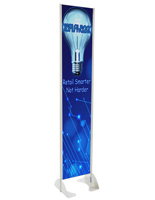 These non-retracting banner stands are designed for indoor and outdoor use, making them ideal for trade show, retail, or promotional use. 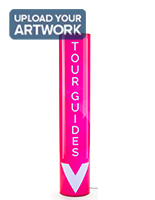 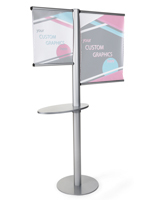 Our freestanding fixtures include customized UV-printed artwork on one or both sides. 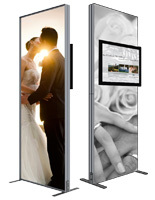 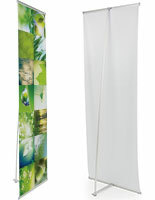 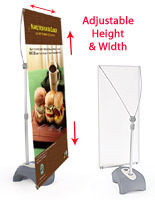 These custom non-retracting banner stands come in a variety of designs including fixed-based models for outdoor use, portable x-frame, and adjustable roll-up styles. 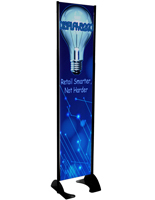 User-friendly options such as TV and iPad mounts, LED illumination, and counter space make these versatile promotional displays a great choice for temporary or permanent marketing in any industry. 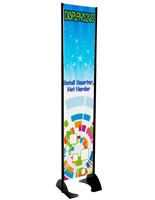 These non-retracting banner stands with custom graphics add a splash of color to trade show booths, retail storefronts, and sales floors. 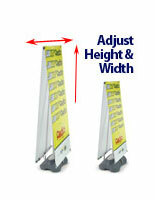 These vinyl signs are a simple, yet effective, tool for advertising products, and special events. 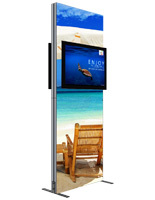 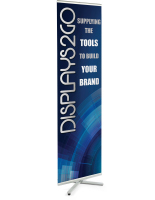 What makes portable advertising displays effective? 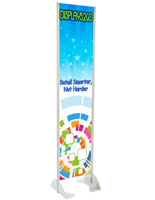 Non-retracting banner strands with roll-up designs are ideal for trade shows as they are lightweight and easy to assemble. 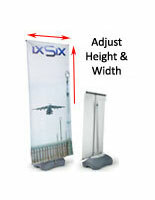 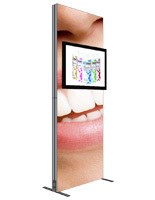 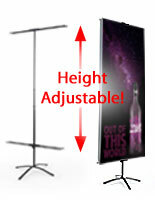 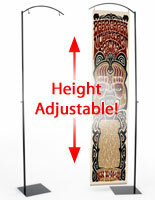 Adjustable X-frame marketing displays can accomodate multiple graphic sizes as needed for multiple promotional campaigns. 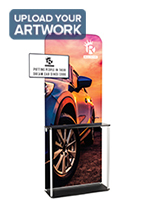 Outdoor banner stands with fixed or permanent bases are designed to withstand inclement weather conditions 24/7 and feature heavy-duty single or double sided vinyl graphics. 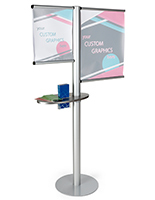 We offer a wide variety of commercial banner stands with options such as TV mounts, shelving, and height and width adjusters. 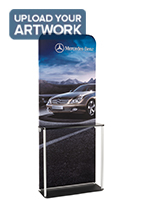 Models range from single, and double sided displays to tripple sided towers. 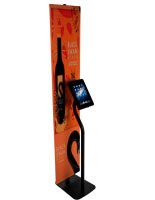 Some of these promotional fixtures with printing are portable and easy to set up. 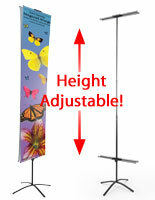 Others are designed for permanent mounting indoors our outdoors. 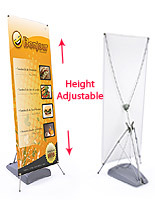 These pull-up and roll-up banner stands, also known as vinyl advertising posters, are a great trade show accessory featuring vibrant graphics and frames that allow for quick set-up and easy break-down. 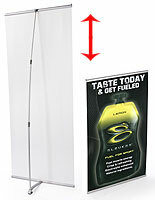 These promotional displays are printed using fade-resistant inks that are designed for long use in high-traffic areas. 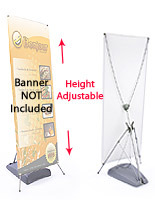 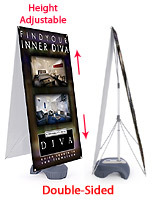 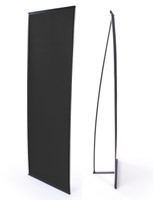 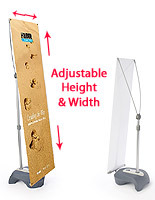 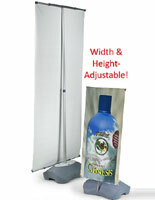 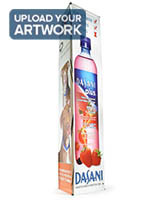 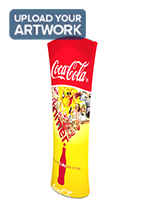 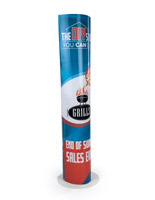 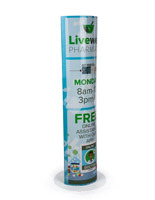 Can these promotional banner stands be used for outdoor advertising? 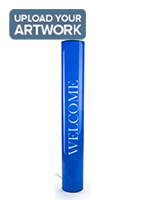 These vinyl signs can be placed outside during ideal weather conditions, perfect for the fall, spring, and summer seasons. 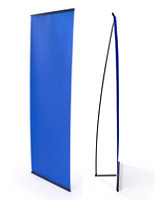 We suggest protecting these stands from damage during rain, wind, or snow storms by taking them inside as a safety measure. 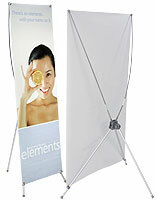 We recommend that these promo signs be brought indoors periodically to decrease fading due to excessive sun exposure. 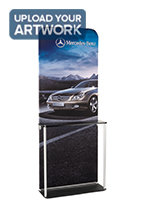 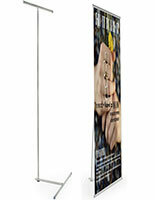 Custom printed banner stands are a great way to advertise goods and services in any industry. 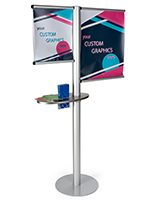 Lightweight portable designs make these easy-to-assemble fixtures ideal for transport and storage in between trade shows or other promotional events. 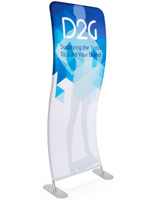 Printed fabric surface options include a range from durable heavy-duty vinyl for indoor or outdoor displays to vertatile hook-and-loop material ideal for use with clip-on accessories for additional marketing space. 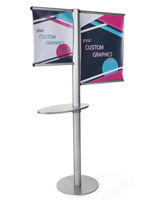 Shop from an impressive selection of indoor and outdoor advertising merchandise such as trade show walls, tables, transportation cases, and even all of the little things you might need to equip the inside of your booth. 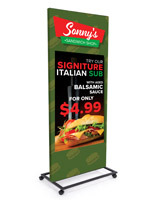 Inform passersby about your business by printing a logo or marketing slogan on one of our banners, and entice them to stop and inquire about your products. 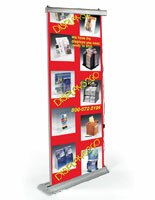 If you to know more about our process, we have a wonderful article about the benefits of UV printing. 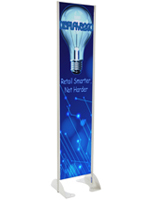 For retail environments, these displays are an especially useful tool for grabbing customers attention and directing it to a newly stocked product. 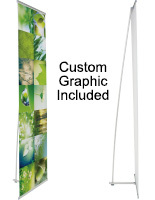 Vinyl banners are ideal for this type of advertising, as the material is exceptionally rugged and holds the vibrant coloring for many years without fading.